This page provides information on how to find a book or other item. While you can use WorldCat Discovery to search for e-books, we also have an e-books resource page with more information on how to find and borrow e-books. 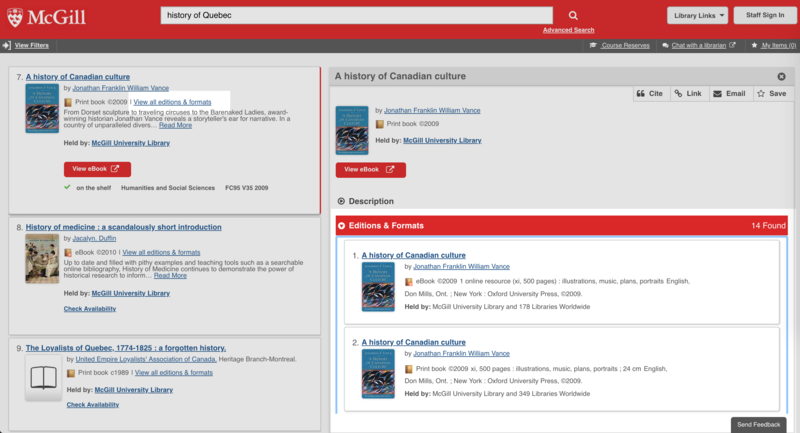 WorldCat Discovery is the main catalogue for all books and other media available through the McGill Library. 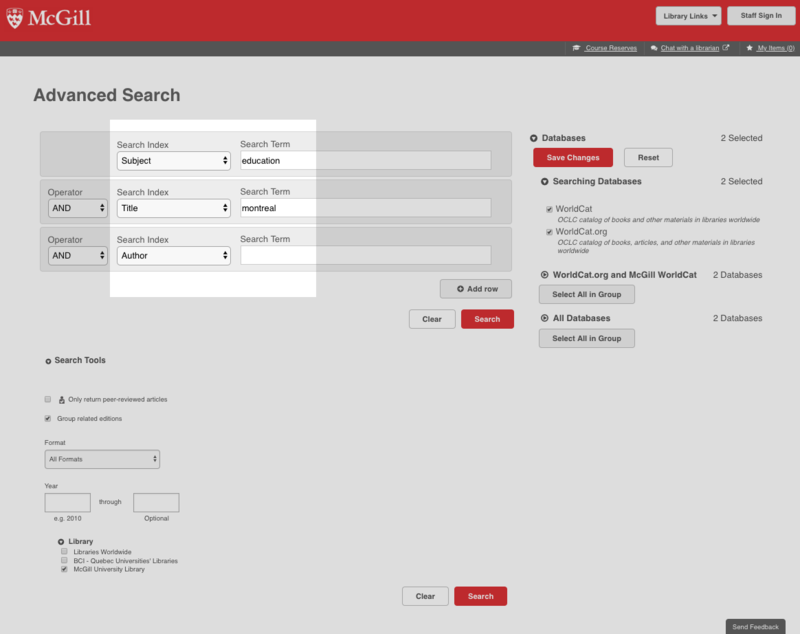 WorldCat Discovery will display your search results, along with several options to filter or sort them. Tip: By default, WorldCat Discovery will treat your keywords as separate words. To search using a phrase, use double quotes. For example, "history of Quebec". 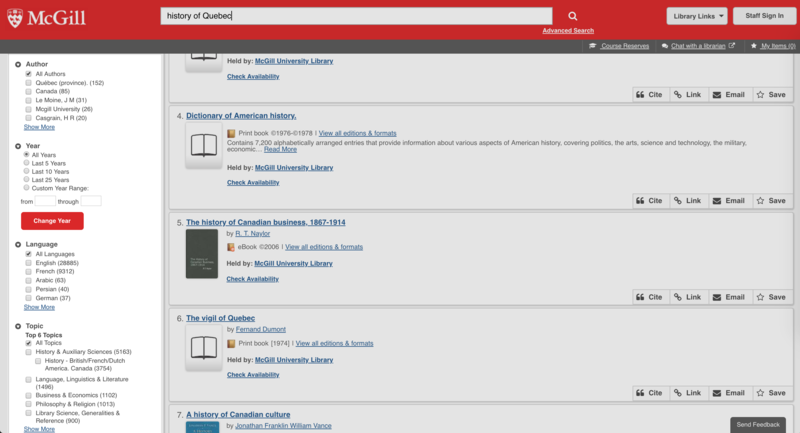 By default, WorldCat Discovery only searches the McGill Library collection of resources. 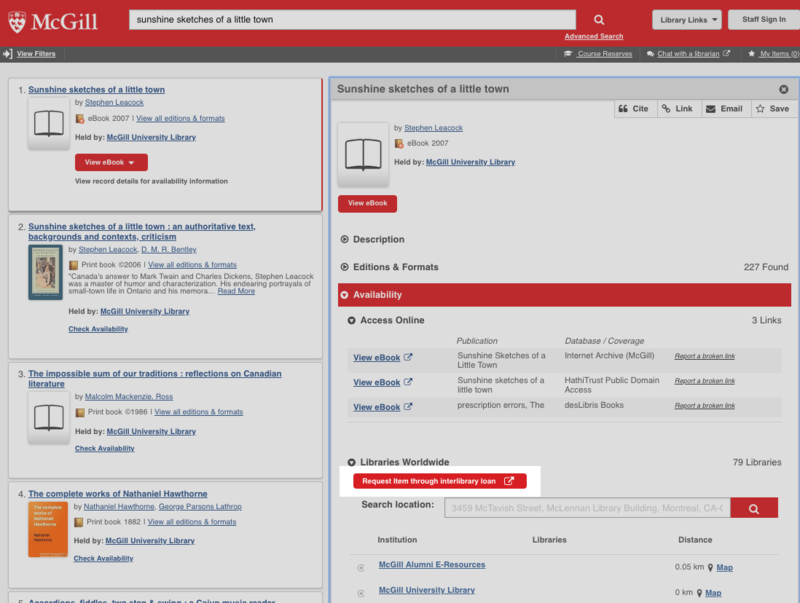 However, you can easily expand your search to include the collections of other libraries. If the book that you are interested in can only be found at another library, you can use our Interlibrary Loan service to request that book. See the Retrieving a book/item tab on this page for more details. Once you have searched WorldCat Discovery you can use the Format options on the left-hand side of the page to choose which formats you are interested in viewing. In this example, the results have been filtered to only show e-books. WorldCat Discovery also provides you with options to to refine your search results. 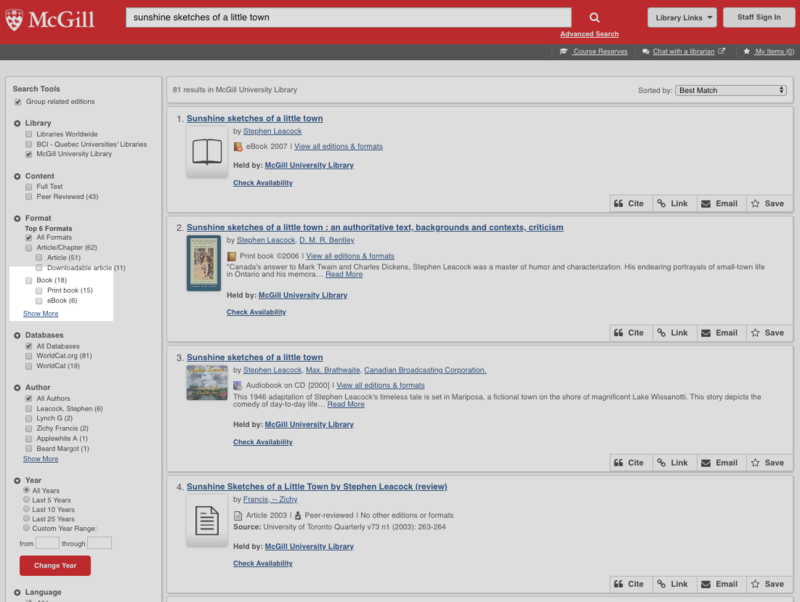 For example, you can view items from a given author and/or items published in a given year. You could also choose to only see items written in a particular language. Note: The options you have for refining search results will change depending on the specific search results. WorldCat will display the options that are the most useful and popular for the items you are working with. 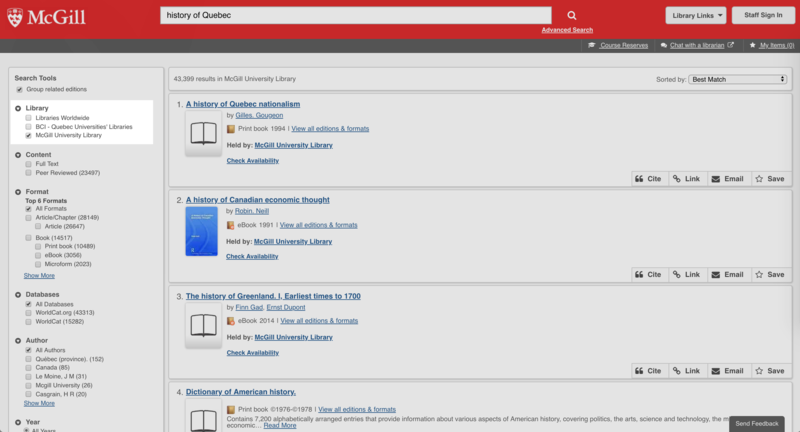 When viewing your search results, it is important to understand that WorldCat Discovery will try to group together various editions of a book into one entry. For example, a book may have been first published in 1989, then again in 1995, and most recently in 2003. WorldCat Discovery will display one entry for all three items. Click on View all editions to view all editions of a particular item. Clicking on the link will display a list of all the editions and formats of the book. You'll notice that this list includes not only all editions of the item, but also different formats, for example, the e-book versions of the title, as well as print editions. 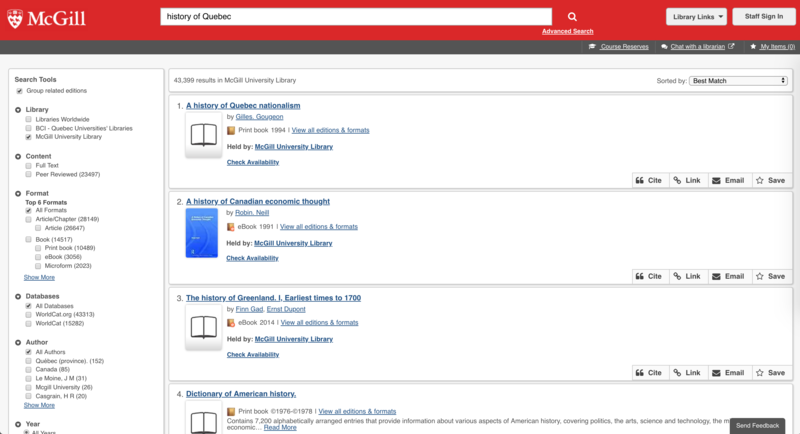 If an electronic version of a book is available, you can access it directly from the search results by using the View Now feature. You can also access an e-book using the links found in the Find a copy online section of the item's detail page. 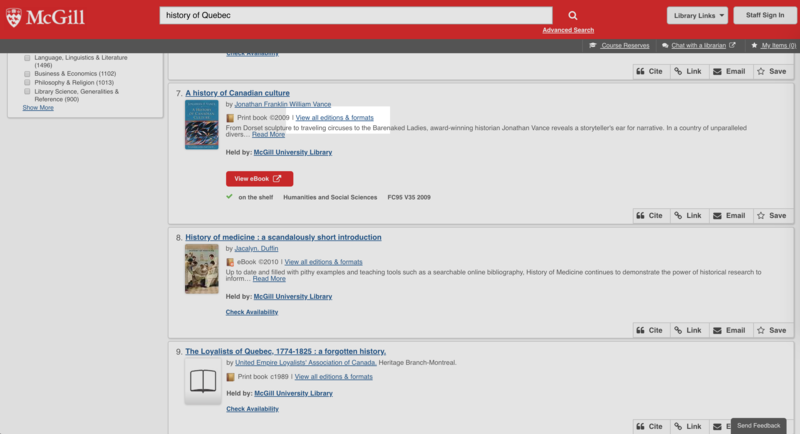 You can use the Availability feature to determine if a book is available in the McGill Library or if someone has it out or if it is on reserve. 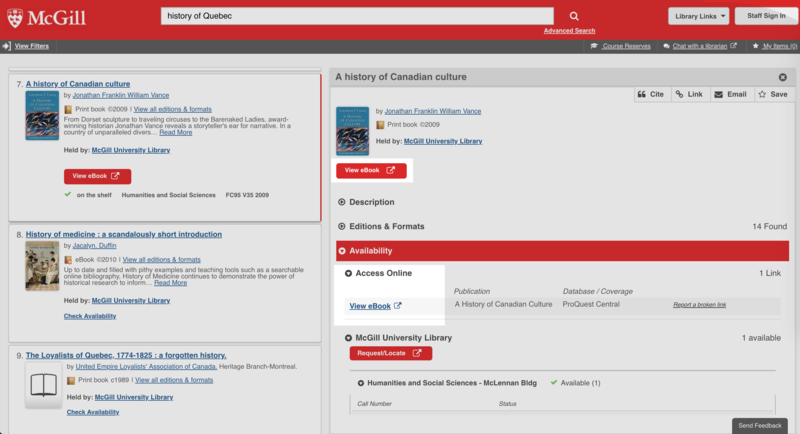 In this example, we see that the McGill Library has two copies of the book. Both copies are in the Humanities and Social Sciences Library but one is on the shelf in the reserve room and only available for a three hour reserve loan. Also displayed is the call number for the book (FC2911 G67 2012). A call number is a code that is used to identify and locate a book within the Library. If you want to find a book on the shelf, make sure you write down the call number (as well as what library branch it is at). Once you've found a book that you want to borrow from the Library, there are several ways that you can retrieve that book from the Library. See the Retrieving a book/item tab on this page for more details. Need help finding books? Ask us! You can use WorldCat to find books on a topic or subject. You can always search using keywords related to your topic to find relevant books and materials. However, WorldCat provides you with features to help you refine and explore your search results to find what you are looking for. Once you have searched for items in WorldCat using keywords, you can use the refining options on the left-hand side of the page to refine your search to only show items on a given topic. You can use the Advanced Search to search WorldCat by subject. The Advanced Search link can always be found under the search box. You can also combine title, keyword, and subject searches to be more specific in your search. 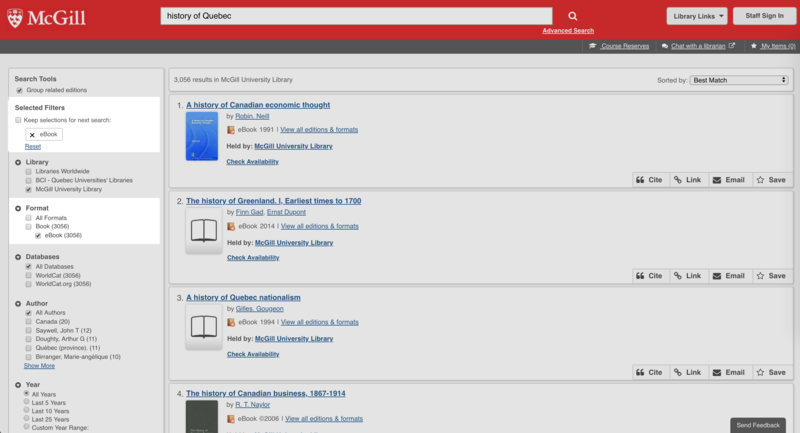 For example, find all books on education with Montreal in the title. Tip: As you can see, there are a lot of other options on the Advanced Search page that you can use to specify search criteria, but those are optional. You can always use the Refine options to narrow your search results. To find a specific book, first use WorldCat to search for the book by title. Tip: For best results, include double quotes around the title of the book (ex. "Sunshine sketches of a little town"). Under Format, select Book to see only books in the results list. Select eBooks if you only want to see books that are available online in the results. 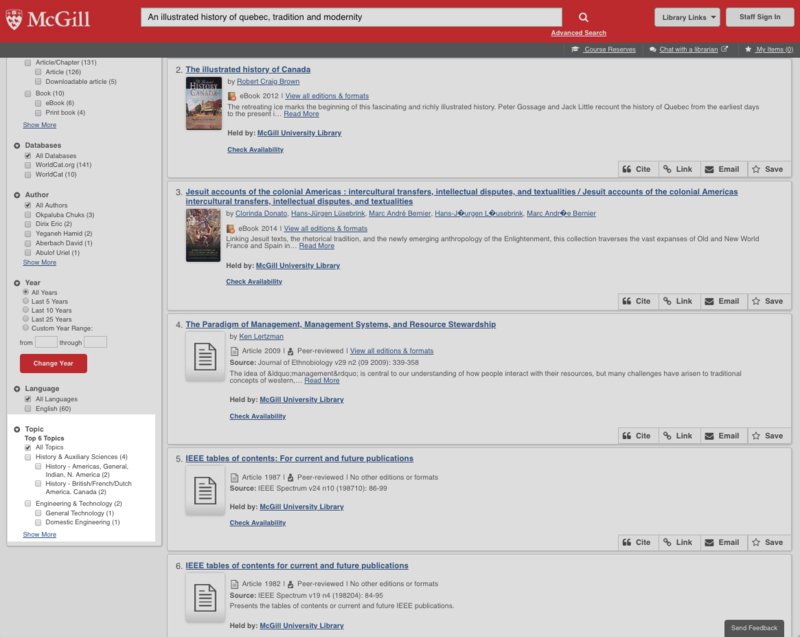 Use View all editions to find the edition of the book you are looking for. 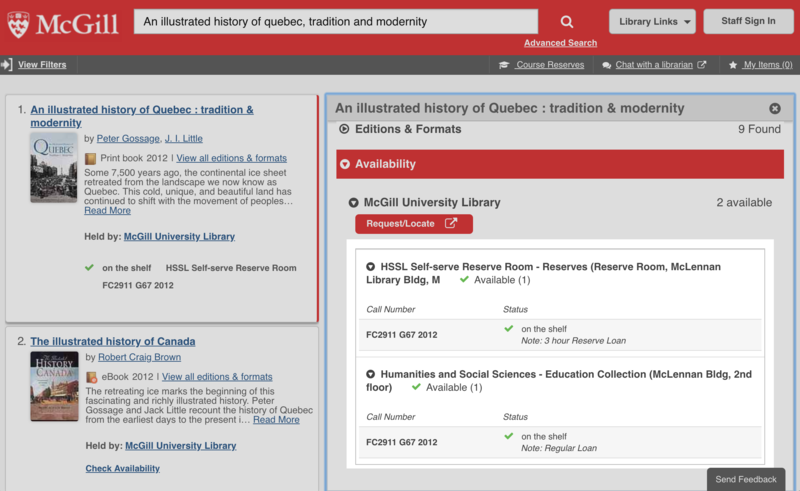 You can use the Classic Catalogue to search for books or other items at the McGill Library using their call number. To search by call number, go to the Classic Catalogue, and under Choose type of search, choose Call number begins with. Type the call number in the search box, and click Go. The Classic Catalogue will display a list of books/items sorted by call number, with the call number you searched for at the top of the list. If you enter a partial call number, the number you are looking for may not be displayed. You can use the Previous Page and Next Page buttons to move backwards or forwards through the list of call numbers to find the item you are looking for. Once you find the book/item you are looking for, click on that item to get the full details. Once you have identified the book or item that you are interested in, if an electronic version was not avaialble you need to retrieve a physical copy. The call number is a reference number that is used to identify and locate items in the Library. Option 1: Retrieve an item from the shelf. If the item is available, you can take note of the Library branch and the call number of the item. There will be signs and maps at the library branch that will help you to locate the item. If you need help, you can ask the person at the service desk in that branch to point you in the right direction. 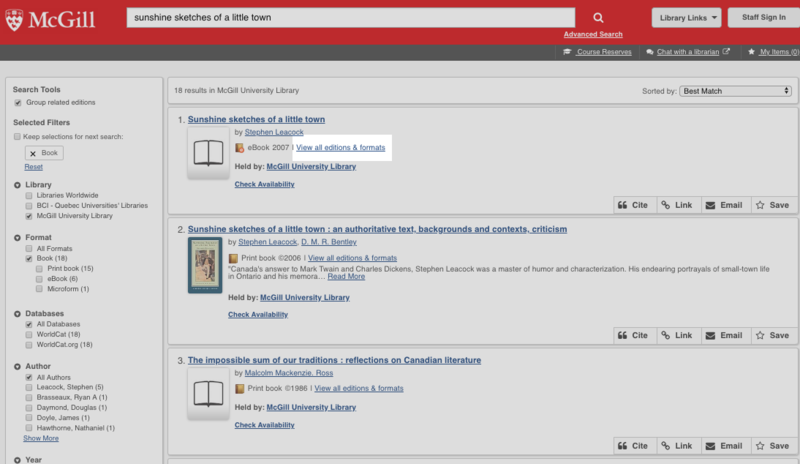 Tip: You can use the Classic Catalogue to look up a book or item by its call number and find where it is in the Library. See the Finding a specific book or item tab on this page. Option 2: Request an item for pickup. You can also use the Request feature to have the item retrieved from the shelf and delivered to the library branch of your choosing. Delivery of the item can take from 2-4 working days if the item is on the shelf. You will receive an email once the item is ready for you to pick up. If the item is on the shelf and you only need a chapter or article from a print item, you may request a scanned copy, which will be sent to your McGill email address. If the item is not available (i.e. someone else has borrowed the item from the Library), you can use the Request feature to recall that item. When you recall an item, the person who has the book will receive an email message notifying them that the book as been recalled. Recalling an item will usually shorten the loan period, so that the person has to bring it back sooner than originally indicated. Once the book has been returned, it will be placed on hold for you (i.e. no one else can take it out), and you will receive an email letting you know when and where you can pick it up. If the book that you are interested is not in the McGill Library collection, you can borrow the item from another library that has the book. Option 1: Interlibrary loan. You can use interlibrary loan (ILL) to have the item delivered from another library. Click here for information on how to make an ILL request. Option 2: Borrow in person from other universities. You can also borrow an item directly from another university library. To do so, you will need to get a CREPUQ card. Click here for more information on borrowing from other university libraries.